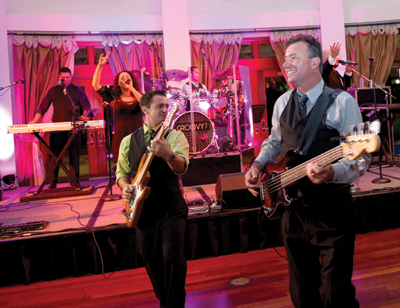 There are three components to a memorable wedding reception, says Scott Schmidt, lead singer of New Orleans-based band The Boogie Men: 1) a venue that has good food and drink and is easily accessible; 2) a crowd that’s game for a good time; 3) and perhaps most important, quality entertainment. Crowd-pleasing entertainment can make for a memorable way to celebrate with the friends and family supporting you on your big day. The two main options for reception entertainment are hiring a live band or a DJ; which one is best for your reception depends on your needs and budget. There are pros and cons with hiring a band or DJ. Opting for a DJ gives one access to a seemingly endless song catalogue and can be a more affordable option. But, as it is with many services, you get what you pay for: Clients need to do their research when looking for a DJ to ensure they choose one with experience. 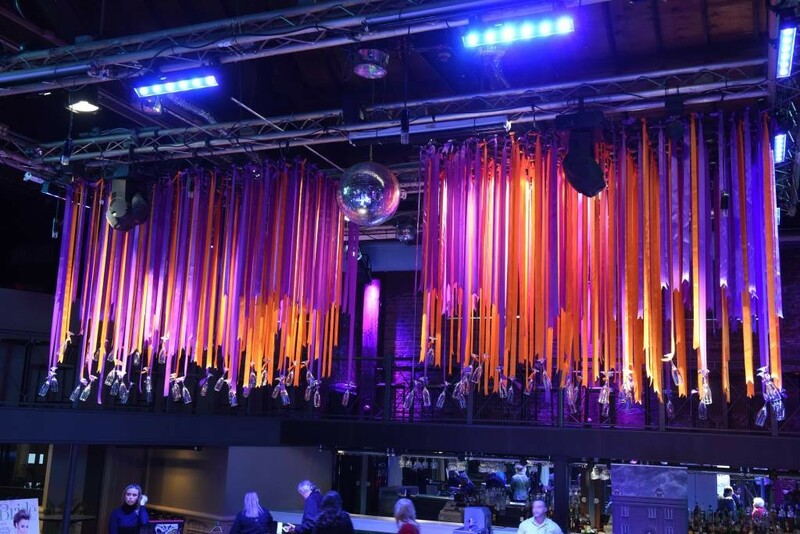 “One concern about hiring a DJ is that with technology being the way it is, anyone can get an iTunes subscription and get power speakers for a modest investment and call themselves a DJ,” says David Storm, DJ and owner of Omega Sound and Entertainment, a company offering DJs and event lighting. “Being a DJ requires a certain level of experience and decorum.” Storm recommends clients vet entertainers using sites like Wedding Wire and The Knot before hiring them. Besides fielding song requests – something that’s not as easy to do with a band – DJs can provide a lot of personal interaction with the guests. DJs can simply announce when the cake-cutting is, or they can be out there on the dance floor doing “The Wobble” with your grandmother. Amy Cuomo of the Baton Rouge-based X-Pert Productions says clients should discuss with the entertainer beforehand which level of interaction they want. “Let [the company] know if you want the DJ who will sit there and press buttons get out on the floor with the guests, making the party happen,” she says. Cuomo says one thing for clients to remember is to be explicit with entertainers about what attire they should wear to the reception. “Some people automatically assume the DJ will come in tuxedo or suit or tie, or it might be a relaxed wedding and they’ll need to come in a khaki or polo shirt,” she says. She also has heard of “theme weddings” where clients want the DJ to wear a certain type of outfit or costume. Whatever the case may be for your wedding, communicate with the DJ beforehand. Omega’s rates for a three-hour reception start at $600 and can go up to $2,500. Rates for X-Pert Productions vary since the company also does lighting, but for DJ services, a three-hour package costs $495. While DJs are more affordable and offer a larger song selection, hiring a band can bring energy and spontaneity to a reception. Rates for a three-hour reception for The Boogie Men start at $3,200 and can go up to $4,200, and Groovy 7 charges $4,500 to $5,500. There are many factors that can contribute to rates, including the date (an in-demand date or a Saturday wedding might cost more) and the type of location. A location where parking and loading in is easy will cost less than a venue where it is more difficult to do those things. Clients should provide bands with all the important times, especially what time the wedding is supposed to end, factoring in the band needing time to park, load in, set up and do a sound check. Seruntine says this process takes about two hours, depending on the venue. They should also let the band know roughly when they would like things like the couple’s first dance, the father-daughter dance, the bouquet toss and other traditions to happen, but to keep in mind that things tend to rarely run on time. Let the band know what special songs you want for important moments like the father-daughter dance or the couple’s first dance, but remember that a busy party band may not have time to learn many new songs for your event. A band can often play recorded music for those special moments if they don’t know the requested song, but if you have a more obscure song list in mind for the entire reception, getting a DJ might be the way to go. And although you should let the band know of any particular genres you absolutely don’t want and some must-have songs, Seruntine says clients should ultimately trust the band to show the crowd a good time. “We all have a killer formula for what we do,” she says. “If a client makes a complete playlist for the whole night, they might be shooting themselves in the foot. If you’re going with a reputable party band, let them do their thing.” Seruntine recommends people try to see the band live beforehand to get an idea of they what they will be like. Schmidt of The Boogie Men – a band that plays “stuff from the Big Band Era to current songs by Justin Timberlake and everything in between” – says the band can usually get a good read of the crowd, letting that dictate the playlist. That, Seruntine says, is when the reception really starts getting fun.